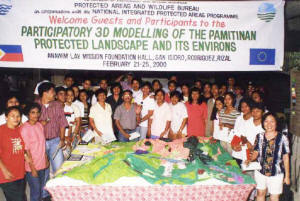 The 1:2,000-scale Participatory 3D Model (P3DM) of the Pamitinan Protected Landscape, Rizal was completed in year 2000. The model is a a quite large scale (1:2000) and covers a total area of 17 km2. The exercise took place in the framework of a capacity building programme run by the EU/GoP-funded National Integrated Protected Areas Programme (NIPAP) for the benefit of Protected Area and Wildlife Bureau (PAWB) (now Biodiversity Management Bureau) staff. 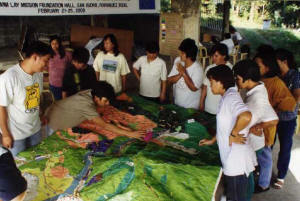 Participants included PAWB staff and residents of areas located within and around the protected area. The area was proclaimed as a protected area through Presidential Proclamation No. 901 dated 10 December 1996. It is located in the eastern part of Rodriguez, Rizal. It covers a total area of 608 hectares.